Agencia AJN: June 11, 2018. In the framework of the 70th anniversary of the independence of the State of Israel, the AJN Agency interviewed Jorge Diener, Senior Director of International Projects for Hadassah International, who was born in Argentina. – Hadassah International is the organization that represents the Hadassah Hospital throughout the world, except in the United States, where there is an Hadassah entity of its own, comprised primarily of women. Hadassah International is an institution composed of Jews and non-Jews that support the Hadassah Hospitals and promote exchanges with medical centers from different places. As a result of the Israel War of Independence, the Hadassah hospital on Mount Scopus ended up on the Jordanian side, and moreover, the director and several of the medical staff, including nurses, were killed in an attack as they travelled to the hospital in a convoy. With that, Hadassah had to start from scratch, and, over several years, formed several centers in Jerusalem. Hadassah’s role as a pioneer continued in educating doctors and nurses to meet the present and future needs of the new country. In the ’50s Hadassah opened the first centers for diabetes, heart, fertility … Then, other hospitals replicated it … At that time an agreement was made with the Hebrew University in Jerusalem to create the Hebrew University- Hadassah School of Medicine at Ein Kerem, the Hadassah Hospital campus that opened in the 1960s, when (then-Israeli Prime Minister), David Ben-Gurion, took the hospital leaders to what at the time was a very remote mountain on the edge of Jerusalem. When they arrived, they looked from one side to the other, and saw sheep. As a Zionist organization, for us it is symbolically very important that Ben-Gurion told them: “You take care of building the hospital, I will worry that this will be in Jerusalem.” It was a meeting of visionaries, and the leadership of Hadassah said: “This is not only a place where the people of Jerusalem and Israel are going to be cured, but the future doctors will be trained and cures will be found for humanity”. And today, 70 years after the creation of the State, Hadassah remains a leading institution in the Middle East in medicine, health and patient care. In fact, in certain areas it is a pioneer in the world. With pride as an Israeli and a Jew who left Argentina, I say that there are things happening right now in Hadassah that in a month, two, three or six will be done in the best health centers in the world … To give an example: in Hadassah the first operation was performed in which two robots were used at the same time, which is a very important evolution in robotic surgery, which has been used for many years around the world. It allows a robot that looks to communicate with another that operates, and it was made with technology developed by the Hadassah doctors. On another issue: we are finishing the experiments with stem cells and about to find a therapy that allows people who have diseases that paralyze part of their muscles, such as multiple sclerosis or ALS (Amyotrophic Lateral Sclerosis), to walk or use their hands again. This means that people who had gone on to live half-heartedly can return to a full life. In the philosophy of Hadassah, the researchers should be the same doctors who care for the patients, and should use what they see at the bedside to generate ideas they can then take to the laboratory. As well as this patient care and research, in the afternoon the same doctors teach the faculty. This daily cycle allowed the development of the first vaccine against melanoma– advanced skin cancer. It is not preventive, but an immunological therapy that takes cells from the patient, and in the laboratory “wakes- up” the lymphocytes, the white cells, that are in the tumor. Normally, lymphocytes fight an infection, but with cancer they do not. In Hadassah they discovered that when procedure is done in the laboratory, the lymphocytes eliminate cancer cells. 80 percent of the patients who have gone through this process more than ten years ago, no longer have cancer … It is a very high success rate… In Hadassah, emphasis is being placed on medicine in which the cure is found for the individual patient. The body offers a lot of options and what Hadassah’s doctors are investigating and discovering day by day is how to activate those elements that will help the patient heal. 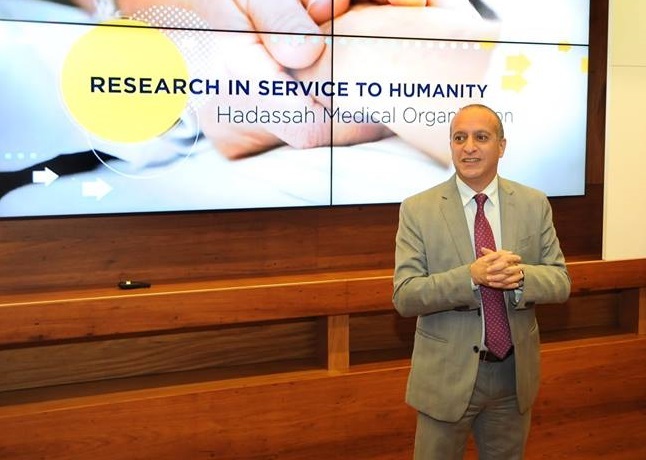 It is a revolution that has a lot to do with the medicine of the future and connects with personalized medicine, which is one of the most important philosophies in Hadassah. It has to do with finding the combination of treatments that allows each patient to be cured. Normally, what traditional medicine does is: “For this disease, this is the treatment and we give it, whether it works or not”. In Hadassah, what is being done, especially when the cancer is very advanced, is to find the best combination of chemotherapy; immunotherapy, (which is using white blood cells); and radiation … as well as determining the best dose for each patient, because the treatment also has a lot of side effects that often affect the patient’s health for the rest of his life. What Hadassah strives for is the treatment that will cure the patient and keep him or her as healthy as possible. This takes place in a department in Hadassah that specializes in this kind of treatment. In Hadassah we have two cyclotrons that, combining the genetic and clinical diagnoses of the patient, create a specific molecule that gives the possibility of individualizing the treatment that each patient needs. This puts Hadassah in a super-advanced place, by generating responses not only for general cures, but also for specific cures. In Hadassah you can find, nowadays, not only cures for specific diseases but also the models that will allow to cure people in a personalized way. – What other specialty calls your attention for its advances? – Another area that is highly developed in Hadassah is chronic childhood diseases: neurological, neurodegenerative, Down syndrome, obesity, emotional or psychological problems … In the Hadassah Hospital on Mount Scopus, (which is now the second hospital, a little smaller and historical because it was created first and we recovered it in ’67, after the Six Day War), we have a unique interdisciplinary center in Israel, and there are very few in the world. It is a place where all the specialties attend the child in a coordinated way at the Mount Scopus Hospital for three hours a day, twice a week. (Any parent who has a child with some type of developmental difficulty knows how complicated it is to have to go to several different places and to get one doctor to talk to another –resulting in a much slower and less effective treatment for the child). The philosophy of the hospital is that the system is to serve the patient so that he has the best quality of life that he can. – It is said that Hadassah is a “hospital for all”. Can you explain this concept? – We are talking about people who can or cannot (pay for the service), Israelis and Palestinians, Catholics, Muslims and Jews … Hadassah was created with a very clear mission: to do tzedakah (social justice), without the differences that one sees in practically everything the world. In Argentina, access to health is guaranteed by law, but there is a great difference in the access granted to those who can pay, and those who rely on the public services. For us, the quality of care that the patient receives in a public service hospital like Hadassah must be similar to that of someone who has all the money in the world to pay for it– both in the equipment that is used and in the facilities– because It is part of their dignity. It is regarded as unfair that a patient must be in a small room, because this is what he can afford. This is part of the Israeli system, but Hadassah takes it one step further and the others have followed its model. Hadassah is also a unique case because 90 percent of the hospitals in Israel belong to the state or to some of the kupot cholim (sick funds). In this model, public resources guarantee the hospital’s construction and development. Hadassah is different. From the beginning, and continuing today, every centimeter that has been built, all the equipment that you see when you visit the facilities, is a result of generous donations from around the world. – The complexity of Jerusalem and the situation of Israel in the Middle East sometimes makes it seem extraordinary for any doctor to live up to the Hippocratic oath to treat and save the life of any patient, no matter who it is. When there are terrorist acts in and around Jerusalem, most (of those affected) come to Hadassah because it is the only level 1 trauma center in the area and the best in emergency surgery. It has happened to us that the terrorist and his victim have filled beds that were side by side, and that both were attended by the same team that was on duty– which might include a nurse and a doctor who is Jewish, Christian or Muslim, or a resident who came from Costa Rica … When they are asked what they think, they answer: “When a patient arrives on the stretcher, I do not ask for the identity document and I do not know if he is Jewish or Arab; I can imagine it, but even if they tell me that he is a terrorist, I will save his life. And then the police will take him and he will be imprisoned for fifty thousand years … “. – What does it mean for the hospital to have Palestinian doctors? – It is with pride that Hadassah helps to train Palestinian doctors, who have no political position, but the need to create their own health system. We do it proactively: we generate programs to train in Hadassah. One of these programs is totally innovative—Hadassah is training the first Palestinian female doctors, a role that women generally do not have. This is having a very important impact, and is important for us as an organization that believes in the most basic philosophy of tikkun olam, which is to help the world. I am an Argentine who came to live in Israel because I always believed that it is a Jewish state that represents more than one hundred years of Zionism, and I walk the halls and offices of Hadassah all the time, but when someone visits Hadassah, he sees the complex demographics of Jerusalem living together in the hospital, sitting side by side. A Muslim kneeling on a rug, praying for a relative they are operating on, next to an orthodox Jew who is washing his hands and saying the bracha (blessing). They are in the same small place, in an experience that does not happen outside the walls of Hadassah. Hadassah’s story is that it is here at the hospital that life unites us, and that is precisely why it is the only hospital in history that was nominated for the Nobel Peace Prize, in 2005. – In the last major development project, a 17-story tower was built with four underground floors. It is a bunker, defined by the Government of Israel as “of strategic interest”, so that all emergency patients can be evacuated in the event of a chemical, biological or nuclear attack. The area is in permanent use because you cannot have four huge idle floors, of at least a thousand square meters, that were designed in such a way that Hadassah will have enough space in case of evacuation. It was thought that the most essential service that cannot be stopped if a siren sounds is surgery. It was decided to have a giant surgical complex on the 4th floor of this tower. The original idea was 20 operating rooms, but at present 13 have been completed. They are the most modern rooms in the world, with virtually nonexistent furniture – everything is mobile – and plenty of space for a permanent innovation center so that the surgeon can operate together with the researcher, the resident and the students, all taking each case to solve and study. – Is it true that in the operating rooms, images of the operations are reproduced in real time? – All the operating rooms have cameras that transmit instantly to the rooms of students who are in the faculty, at about 500 meters away. This also allows a doctor who sent a patient from – for example Costa Rica – to be operated at Hadassah, can see what they are doing online, as well as students from all over the world. – Who runs the hospital? How much does it have to do with all this? – The director general, Professor Zeev Rotstein, plays a very important role. He is the most experienced in Israel and previously led the other major hospital in size, Tel Hashomer in Tel Aviv. He came to Hadassah two years ago to take Hadassah to even higher heights in the next 10 or 20 years. He is a cardiologist, but he has 18 years of experience in hospital management and is a visionary not only in medicine, but also in the efficient use of resources to generate a center of excellence in public health. – What link do you have with Latin America? How do they work with the region? – We work very intensely in Latin America, which is one of the most important regions of Hadassah International, and this has to do with the deep and active Zionism of the Jews of this region: they travel frequently to Israel, and their connection is really unique. In recent years we have worked hard in Mexico and Brazil, two large communities, with a lot of philanthropic activity. We generate resources through the generosity of many people, and the Jews of Mexico and Brazil have been very generous, and have had a proportionally large participation in the construction and development of Hadassah projects in the last 10 or 15 years. We also went to Tucumán, at the invitation of the governor (Juan) Manzur, and we are generating a series of cooperation programs in emergency trauma for the different health centers of that province. These are things that can have an impact … The mega businessman (pharma and others) Hugo Sigman took a very important leadership role in generating those opportunities because he believes that Hadassah has a lot to offer to Argentina, which has a very high standard in medicine. I met him a year ago, when I came back to explore the possibilities that something could be done here in Argentina. – Are there other names to highlight in Argentina, Mexico and Brazil? – Yes. Hadassah International has a modality whereby we work with volunteers who collaborate with our activity. Latin America is a priority for Hadassah because it is a place where there is a very large solidarity with Israel. We have been in Brazil for several years, and we have a Board of Directors, with Fabio Wajngarten as president. In Mexico we are setting up a new board with the Director Ethel Fainstein, (who is also Argentinian), because the previous one no longer functions. In Argentina we have started to form a very important board, with Fanny Ribak, Ale Kelman and Romina Libster, who is a very important young researcher on vaccine issues. I am in charge of leading the Hadassah group’s activity in Argentina, and I travel periodically, working with this group of volunteers. We want to invite all the people who want to collaborate, cooperate and support the activity of Hadassah to join us.